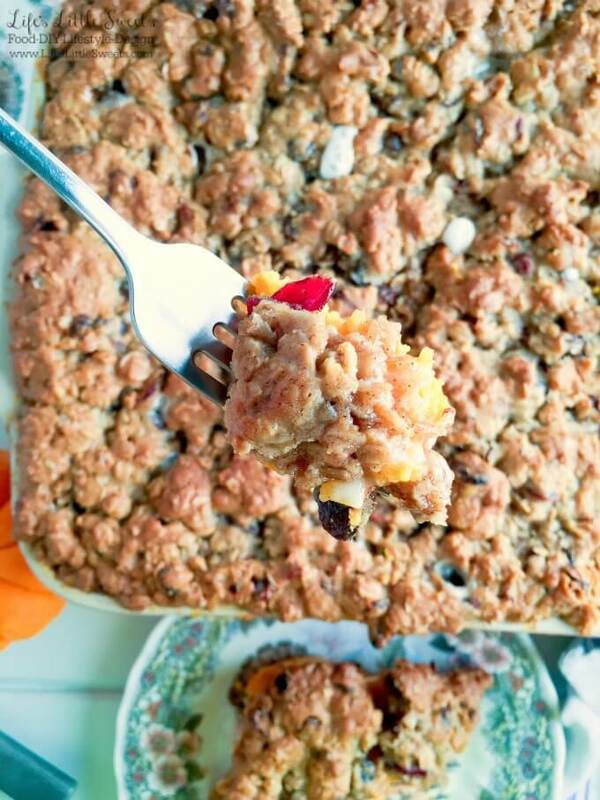 Oatmeal Cookie Marshmallow Sweet Potato Casserole: I am a contributor to Amanda’s Cookin’ and this recipe first appeared on there as Oatmeal Cookie Sweet Potato Casserole. 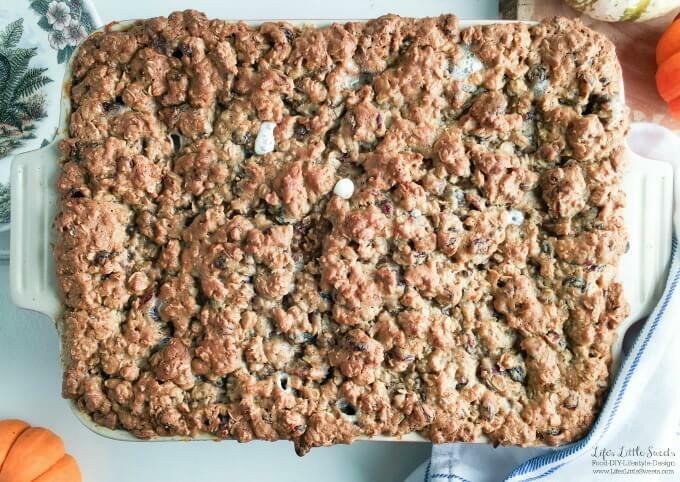 Oatmeal Cookie Marshmallow Sweet Potato Casserole is the dish that everyone is going to look forward to because it’s like having a dessert during dinner! 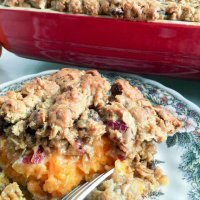 It has a classic sweet potato casserole, with a layer of marshmallows and then topped with oatmeal raisin cranberry cookie crust! 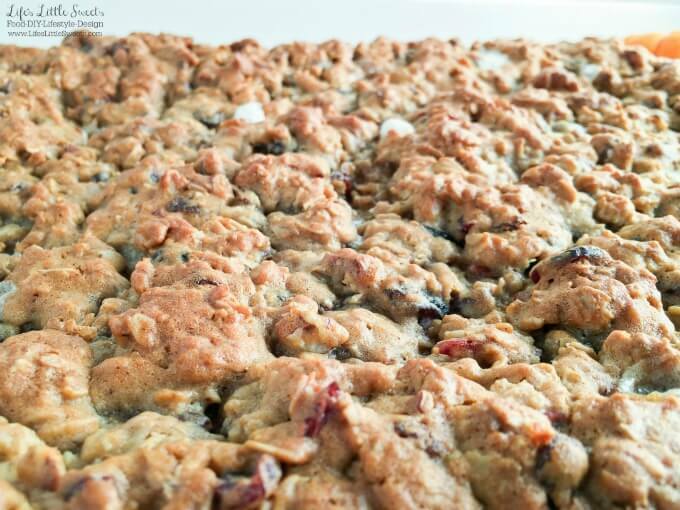 This recipe is partly inspired by my Oatmeal Raisin Cranberry Cookies recipe. I added 1/4 cup chopped pecans which goes perfectly with the oatmeal cookie crust and sweet potato. If you prefer, you can substitute the same amount in walnuts or skip the nuts altogether. 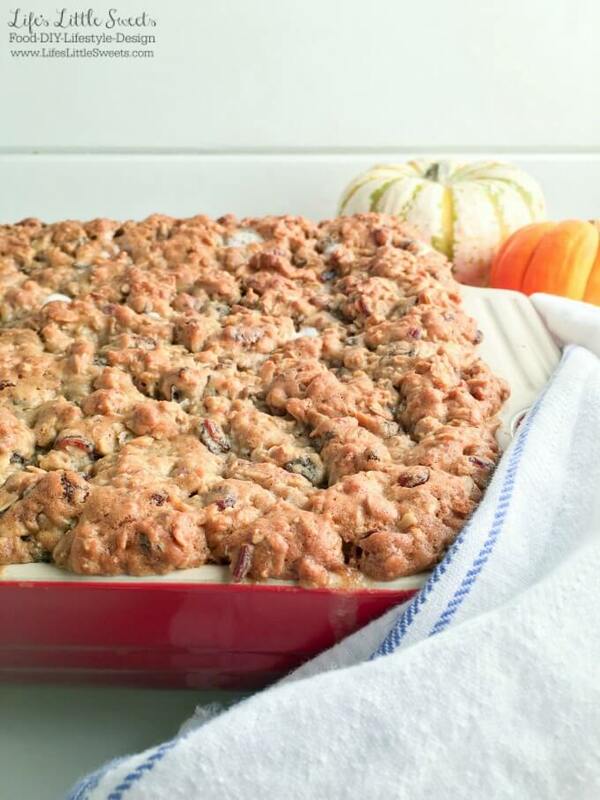 I found that the addition of pecans added a nice, subtle, nutty crunch to the casserole. Optional: up to 1 cup of sugar *depending on sweetness of sweet potatoes, if the sweet potatoes are really sweet, then I usually skip the sugar. 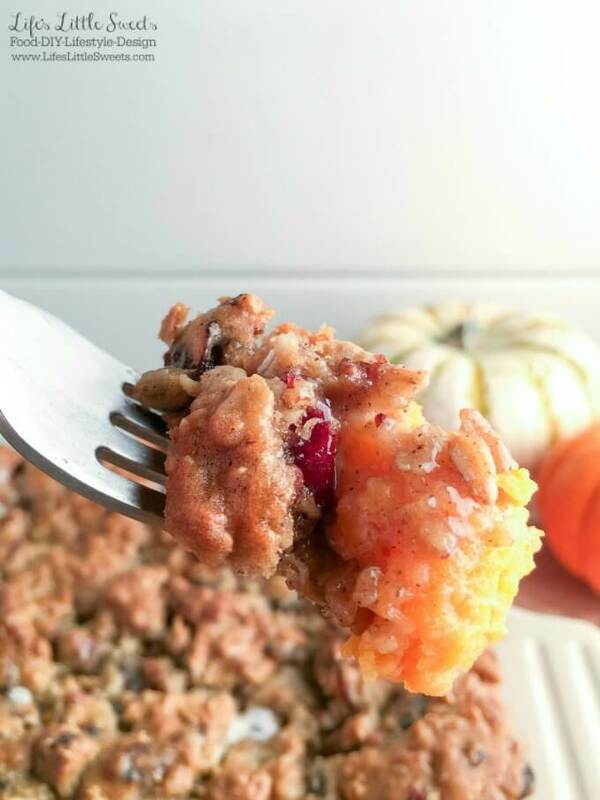 To save time, you can make the oatmeal cookie topping and the mashed sweet potatoes ahead of time the day before. When you are baking the sweet potatoes you can just bake them on the wire rack or on a foil-lined baking sheet if you don’t want any drips in the oven. Make sure you wash and stab the sweet potatoes with a fork before baking. 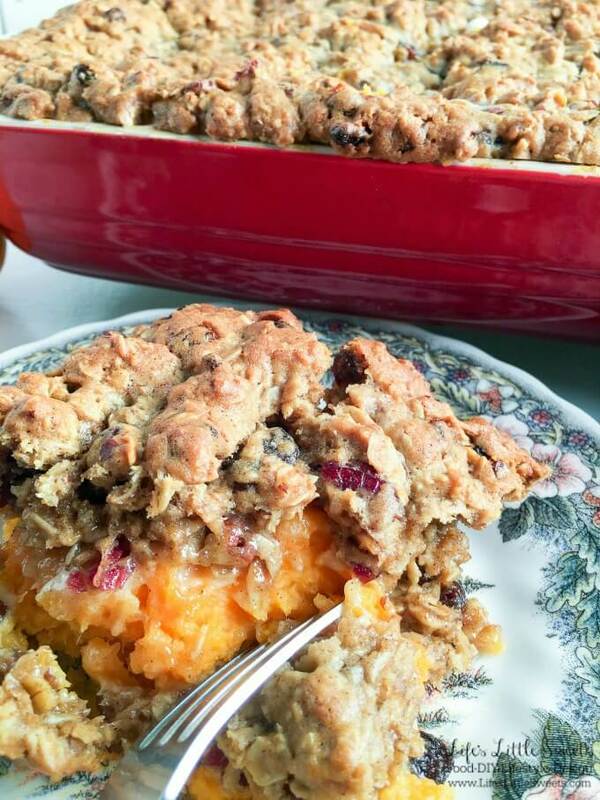 The baking time can really vary for the sweet potatoes because the varying size of sweet potatoes. I usually set the timer for 1 hour (at 350 degrees F) and poke a fork in them to test. The fork should go in and come out easily and if there’s any resistance they need more time. You might have some smaller ones that are done and larger ones that need more time, so just leave the ones that need more time in and check periodically until fully cooked. Make sure you measure the 5 cups of sweet potatoes and the other ingredients exactly because you will need the entire volume of the pan for this recipe. You can bake the casserole over a cookie sheet if you are concerned about drips. The casserole’s total baking time is 40 minutes but it’s possible that it will be done at 30 minutes depending on preference. I add an extra 10 minutes, with an optional foil tent to get a really crispy oatmeal cookie crust you you might prefer something different. Make sure all the ingredients at every layer are evenly distributed to ensure even baking. 13″ x 9″ x 2″ oven safe baking pan or better a 13″ x 9″ x 3″ baking pan – I have a 13″ x 9″ x 2″ pan and with all the ingredients it does get a little overfilled above the upper edge but as long as all the ingredients have been measured properly and evenly spread, everything should fit. You can always put a cookie sheet under the baking pan if you are concerned about drips. 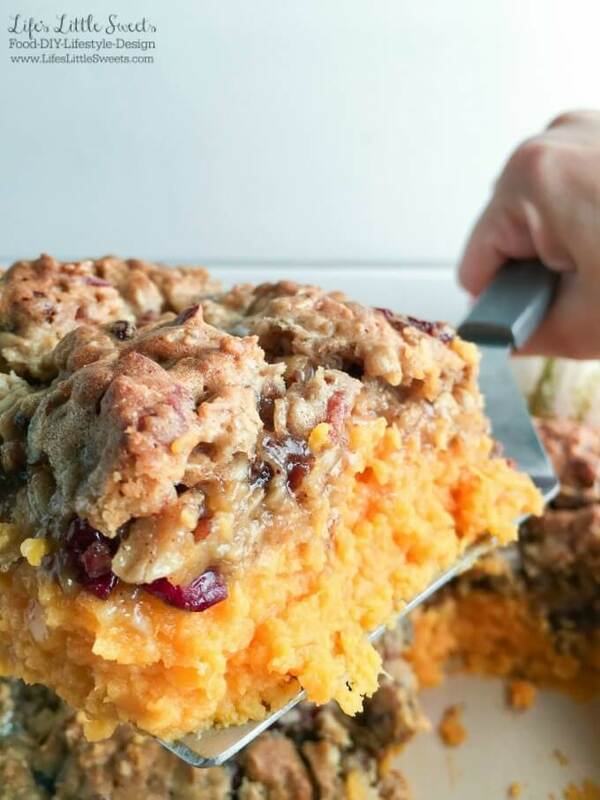 Electric hand mixer or stand mixer – I used my hand mixer and that had sufficient power for mixing both the oatmeal cookie crust and the sweet potato casserole filling. I hope you enjoy this sweet and delicious casserole as much as my family and I do! Enjoy! Optional: up to 1 cup of sugar *depending on sweetness of sweet potatoes, , if the sweet potatoes are really sweet, then I usually skip the sugar. Preheat oven to 350 degrees. Bake sweet potatoes for 1 hour or until cooked and tender. When they are done, allow them to cool completely. Grease a 13” x 9” x 2” oven-safe baking pan, set aside. Note: All the ingredients, including the eggs, should be at room temperature before starting the oatmeal cookie topping. In a large mixing bowl, beat the softened butter, brown sugar, granulated sugar on medium speed until creamy. In a small mixing bowl, combine flour, baking soda, cinnamon and salt and mix well. Add combined dry ingredients incrementally to creamed butter mixture, mix well. Add 2 eggs and vanilla and mix well. Add oats, cranberries, raisins and chopped pecans, mix well. Peel cooled sweet potatoes and measure exactly 5 cups mashed sweet potatoes. In a large mixing bowl, mix mashed sweet potatoes, 2 eggs, 1/2 cup milk, 4 tablespoons butter, 1 teaspoon vanilla, and sugar (optional depending on taste preference). Spread sweet potato mixture evenly in the greased 13" x 9" x 2" baking pan. Add mini-marshmallows in an even layer on top, press them down. Add oatmeal cookie dough in an even layer on top of the marshmallows. Alternately, you can reserve half of the mini-marshmallows to have on top of the cookie layer. Bake for 30 minutes at 350 degrees F on the middle rack. At 30 minutes check on the casserole and if you are concerned about the top browning too much, add a foil tent over the top. Bake for 10 minutes more for a total time of 40 mins. When the casserole is done, allow to cool for at least 10 minutes before serving. Enjoy!